Galettes, also called crostatas, are simple free-form tarts. I love their rustic quality and how no 2 galettes are the same. They hold such artisanal appeal for me and offer a more relaxed approach to dessert. This berry version gets a triple burst of lemony flavor from a fragrant lemon balm* studded crust and berries tossed in lemon zest and lemon juice. Any lemon herb could be substituted for the lemon balm. Roll the crust of your choice out on parchment paper so it is easier to transfer it to a baking sheet holding onto the parchment paper edges. The galette will be baked on the same parchment paper. For the best success, add the berry mixture once the crust has been transferred to a rimmed baking sheet. Serve warm with vanilla ice cream for a lovely summer dessert. One of my edges was not quite folded over enough and some of the fruit juices ran. It was still delicious! Bake up this simple tart and savor a slice of summer. Roll out your pie crust on parchment paper cut just slightly wider than your crust. Carefully transfer to your baking tray. Press the lemon balm into the crust and sprinkle more on top. In a large bowl, toss the blueberries with the lemon juice, lemon zest, sugar and flour. Heap in the center of your prepared crust, leaving 1 inch of pie crust all around without any filling. Stud the top of the blueberries with the raspberries. Fold the edges of the crust over, ensuring the filling is contained in the crust. Sprinkle the folded edges of the crust with the sanding sugar and dust the berries with a bit more. Bake at 400 F for 45 to 60 minutes. Let cool on the baking sheet at least 15 minutes before handling. Carefully lift the galette by the edges of parchment to slide it onto the serving plate. Use scissors to cut away the flanges of parchment paper. Enjoy warm with vanilla ice cream. 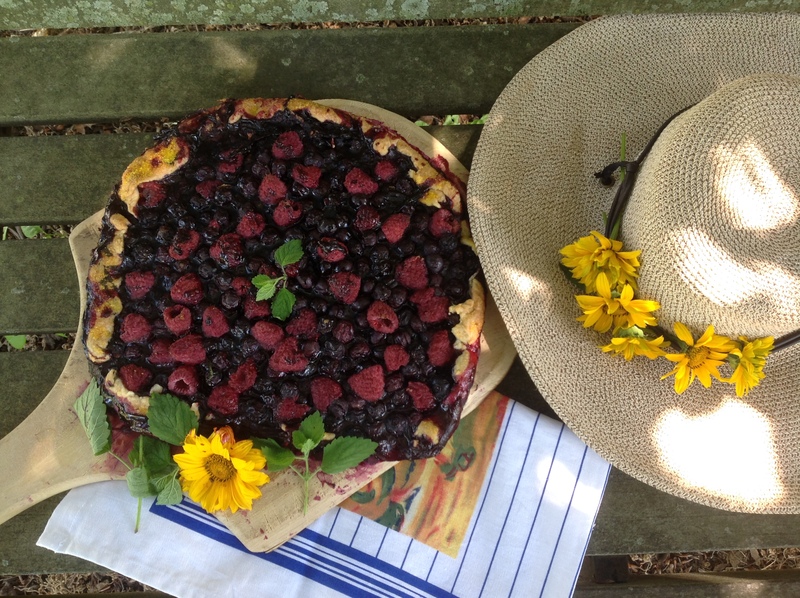 This entry was posted in Recipes and tagged berry crostata, berry galette, lemon balm, lemon balm studded berry tart, open faced summer berry tart by Johanne Lamarche. Bookmark the permalink. I would love to go on a summer picnic with this rustic galette Johanne , looks lovely. For some reason I don’t have lemon balm growing….need to plant it . This galette would be perfect for a picnic! Lemon balm is also a good mosquito repellent Zeba. I wish I could give you a clipping of it from my garden….I have a ton growing! It is really good in pound cake too. Thanks for the tip. I will get it this weekend! 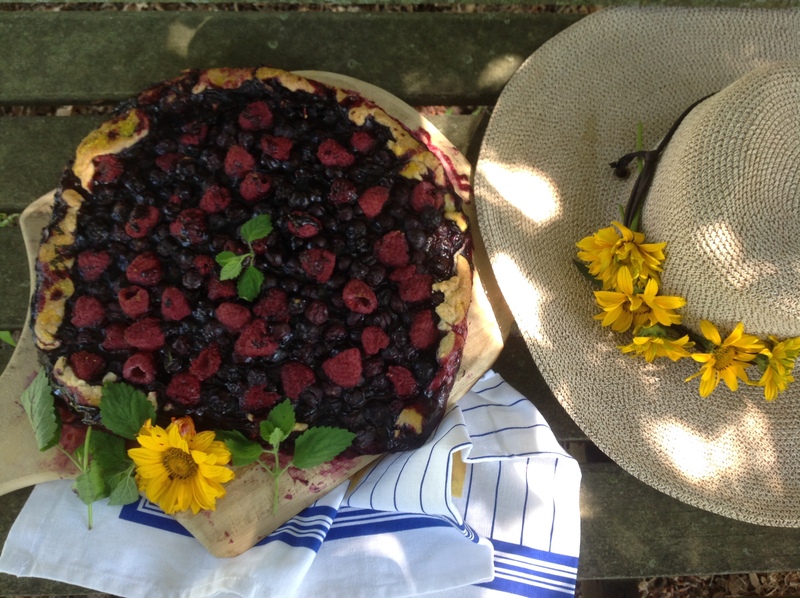 I love to make crostatas and galettes Johanne, and yours with berries and triple lemon sounds like summer perfection! I have admired many of your galettes Jenna! They are so easy and so good. I hope you will give this one a try. You will love the extra lemon in it! You come up with the most creative dishes! This one is a perfect summertime treat! My favorite kind of dessert, jam packed with berries. I used to have lemon balm in my garden in the other house, i know what you mean about being invasive even though I had it growing in a pot. I love the picture of the bits of lemon balm in your dough. Lovely! Good morning Loretta! I will always choose a fruit dessert over any others and this pie was loaded with plump berries. When you come and visit, I will dig up some lemon balm for you to grow in a pot again if you like. How did you use your lemon balm? I wish I lived close enough to get a bit of your lemon balm Johanne! Your tart is lovely and I like the combination of berries and the lemon balm. So summery. Hope you are well. Good morning Teresa! We both had lemon-blueberry on the brain this week! I know you would love this simple galette too. I can imagine how creative you would become with lemon balm in your kitchen. Gorgeous and so fun with the lemon balm – thanks for the parchment hint – I often have trouble with the transfer to a sheet and running, and that takes care of both! What a fun factoid! There are many phrases from other areas I’d love to start using! the English phrase Lolly for dessert, Australian Bickies for cookies. And another Australian term, “Scrummy.” 🙂 I’m not really a huge crust fan, either.